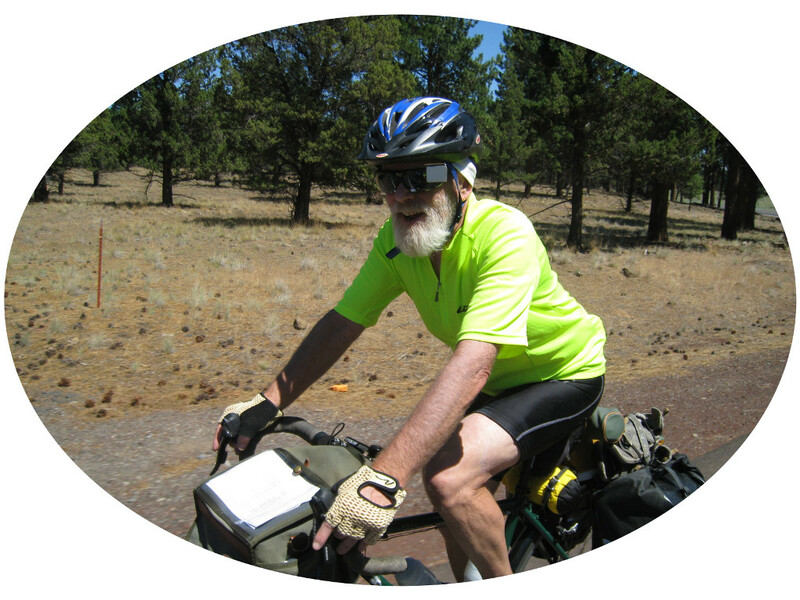 This tour was delayed a couple of weeks as I was recovering from being hit by a car on July 30, 2012. It also involved a new bike. 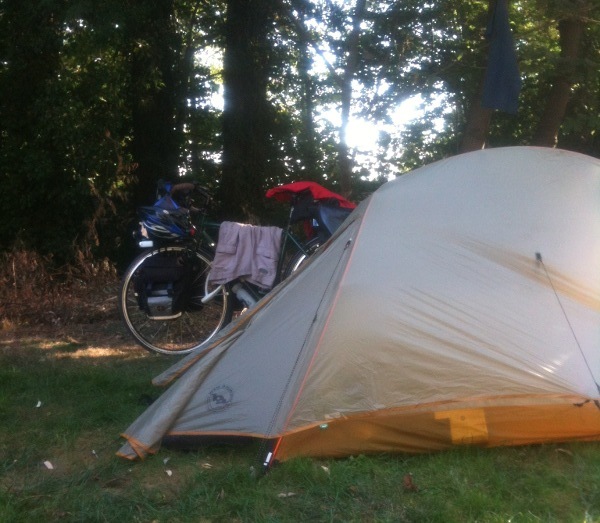 The Surly Disc Trucker which I got in April was now wrecked, and in it's place I now had a new Soma Saga touring bike. The Saga was really the bike I wanted and this would be it's maiden voyage. 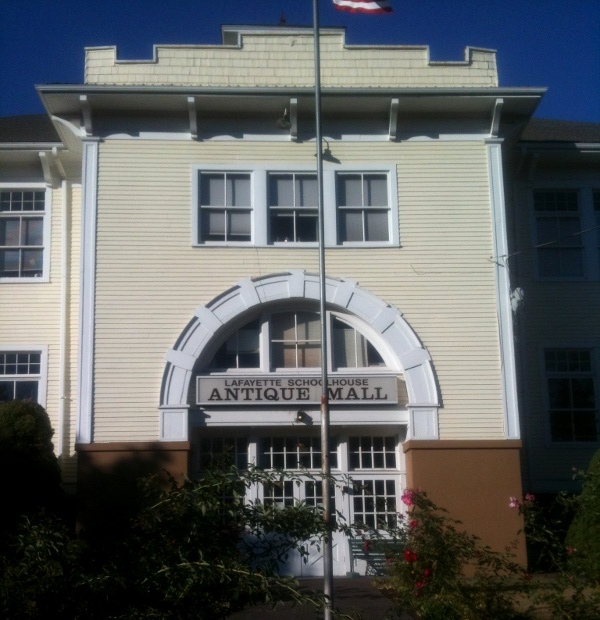 This would be a door-to-door tour from my house in Corvalis. 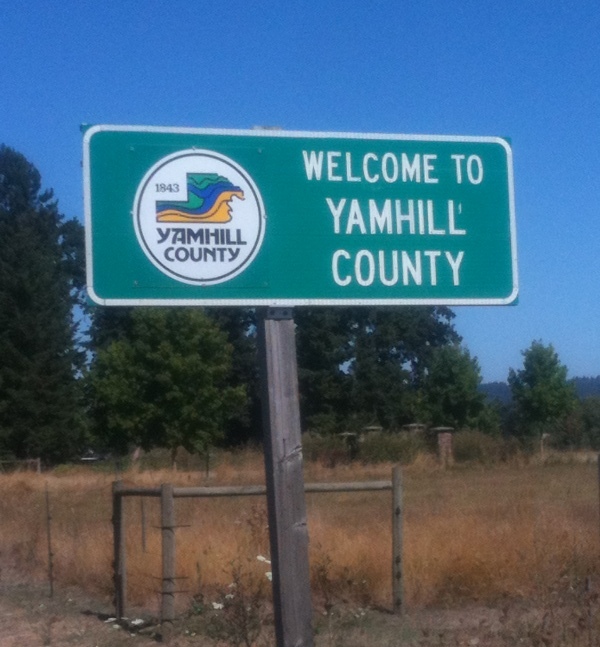 I knew I'd be dealing with some traffic and unpleasant roads heading north through the Willamette Valley, but I really wanted to make it a loop. 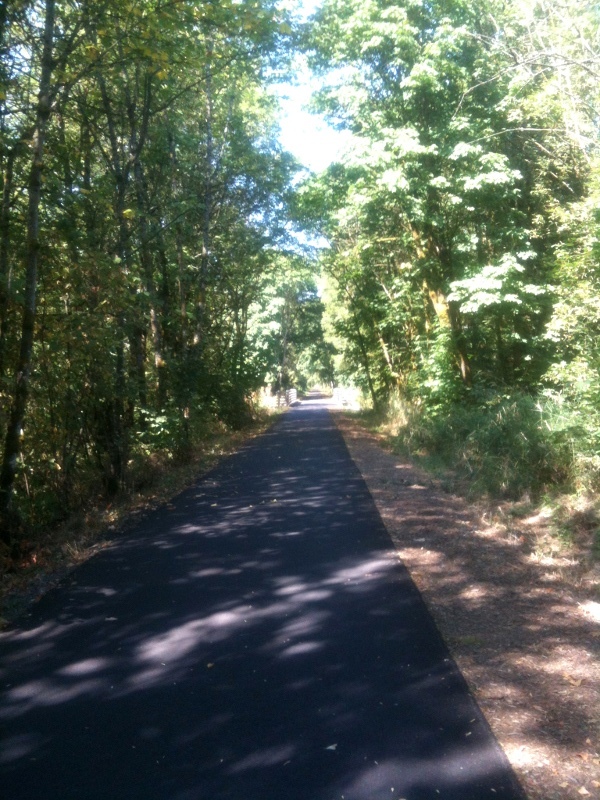 As it turned out the Banks-Vernonia trail, and Stub Stewart park were well worth the ride. 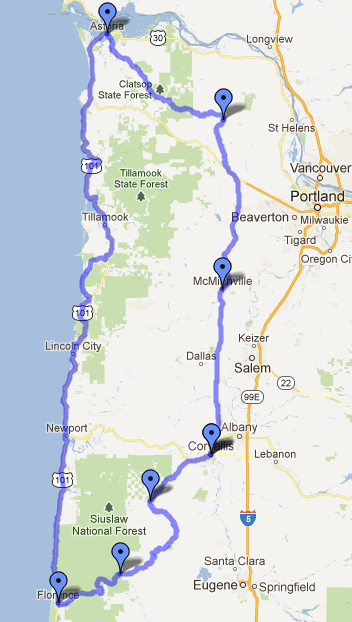 Once on the coast I'll be roughly following the Oregon Coast Bike Route. 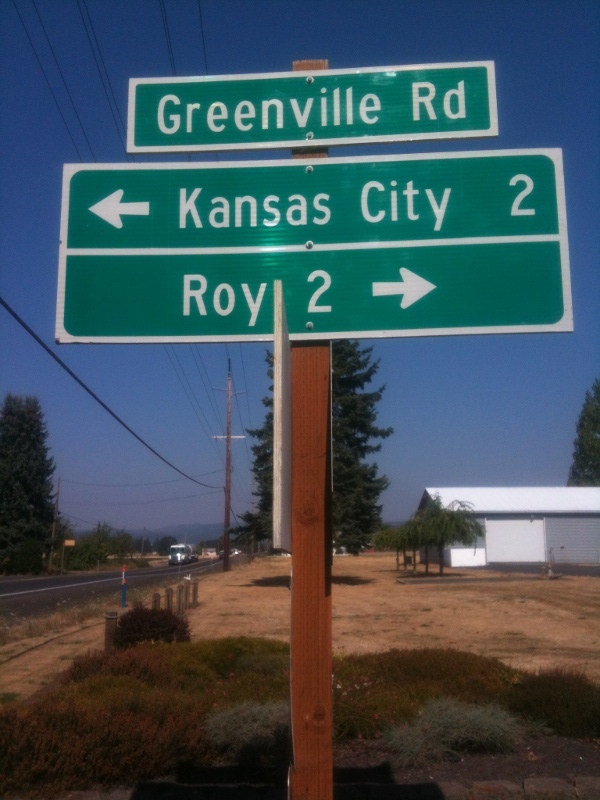 My actual route was shorter than the map on the right as I cut over from Waldport to Corvallis on highway 34. Day one of my Coast Loop. Definitely a bit of trepidation less than two months from being hit by a car. I rode on 99W most of the day, which has a nice wide shoulder but plenty of traffic. Still tense up with each approaching car. I hope to be on quieter roads tomorrow. 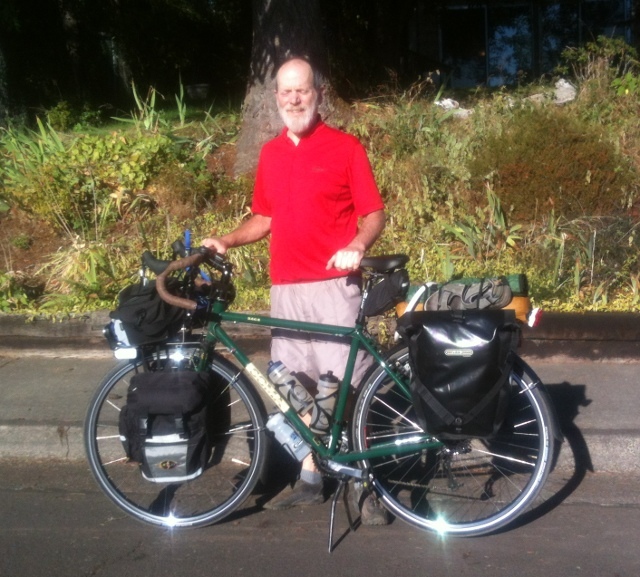 Heading out on the maiden voyage for my Soma Saga touring bike. Camp was at a trailer park. People were friendly but the grassy area was also where they took their dogs. Woke up to gray skies. A few miles of moderate climbing into the fog, and then 20 miles downhill in the mist. Got damp but not too cold. Stoped at Onley for hot tea, which helped warm me up. Lady there said the reason the road was so quiet was because the woods were closed to logging due to high fire danger. So no log trucks! From here there was a nice back road that wound around a bay and on into Astoria. Astoria itself is no fun for cycling. Lot's of traffic and tourists. I managed to find the co-op where I stopped for lentil soup and got some food for the road. Took some pictures but is was dark and gray. Looking at the bridge on 101 I was sure glad I didn't ride over from Washington. 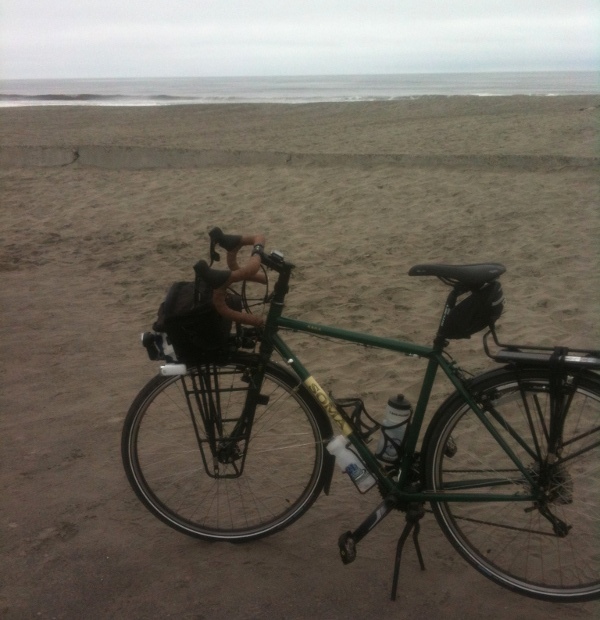 It took forever to get to Fort Stevens park, and when I got here I was pretty cold. The hiker/biker camp did not look very inviting so I got a yurt. 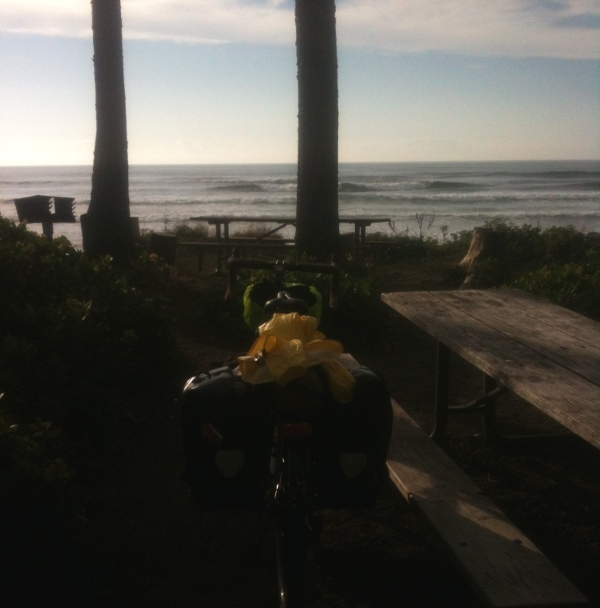 After a shower I rode the mile bike path to the beach. Feels like I crossed a continent to get here. On the beach was an old ship wreck which evidently is quite famous. 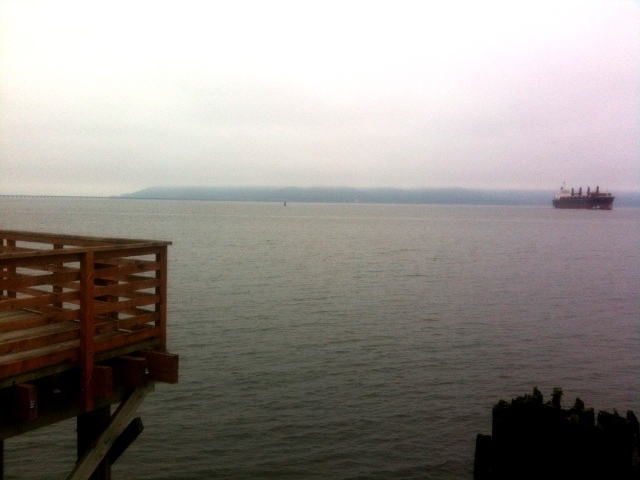 The Columbia river from Astoria. 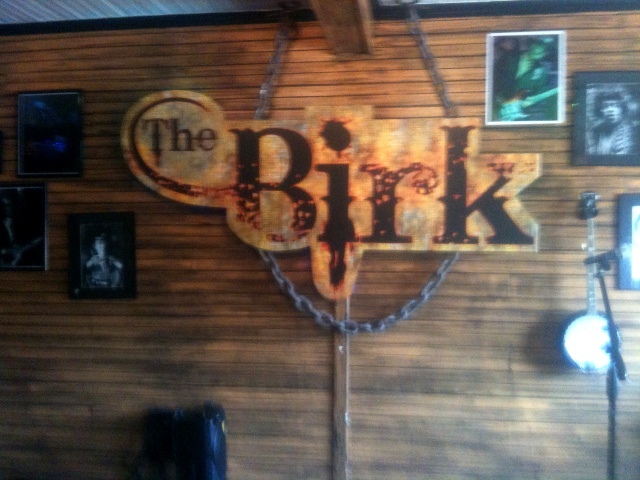 It was great to have ridden here from my house. Made it to the beach. Today was the day when it all came together to make the whole trip worthwhile. I took an alternate route on Foley Creek and Miami River which got me off of 101 for 15 miles. I was hoping it would be sunny a bit further inland but no such luck. More misty clouds but a nice ride through a pretty coastal valley. 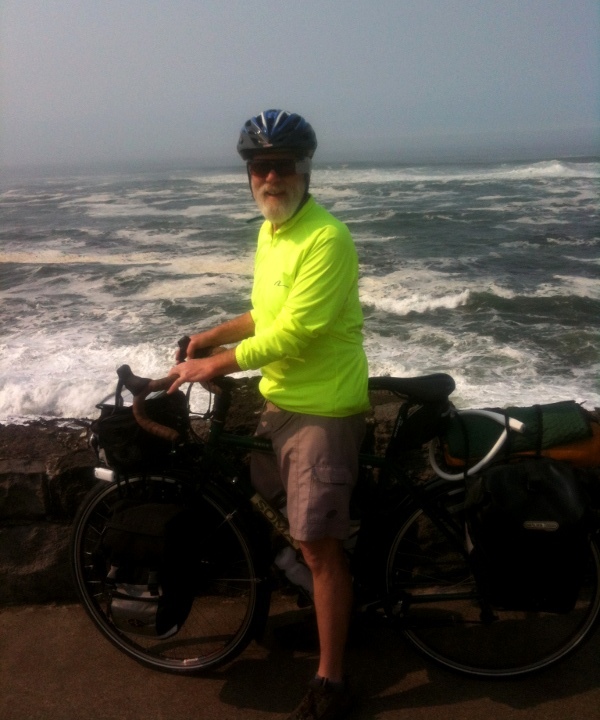 Back on 101 along Tillamook Bay was also very nice. 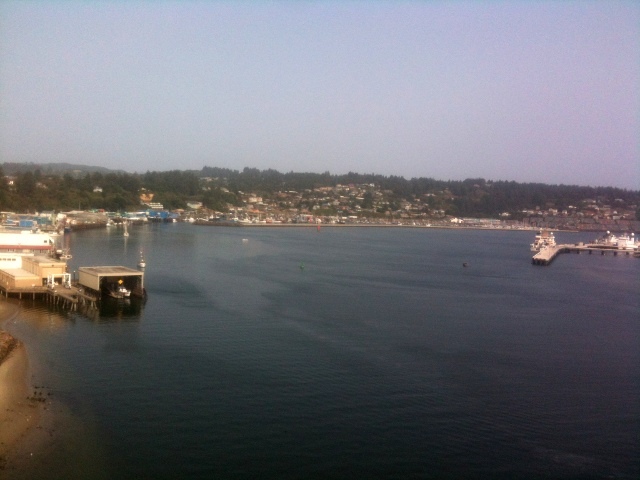 Lunch and shopping in Tillamook and then west through dairy country and back along the south end of the bay on a narrow road with little traffic. The mist was gone and I could see blue sky over the ocean. 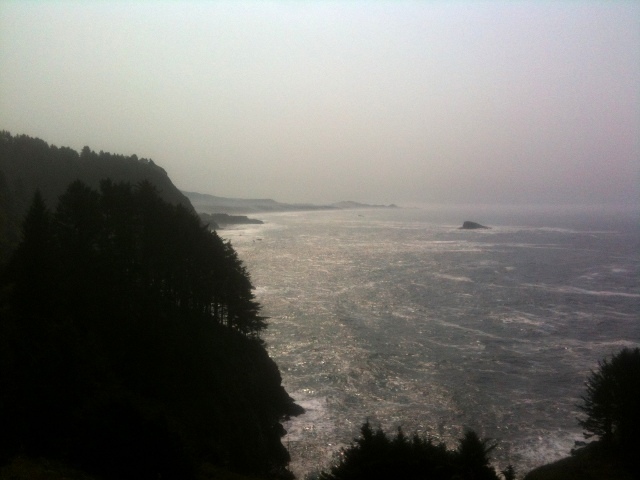 I did not take the extra loop around Cape Mears but instead followed the main route which began to climb steeply through a lush coastal forest. Eventually I popped out at Oceanside to a beautiful beach with a surfer out on the waves and the sun starting to poke through. 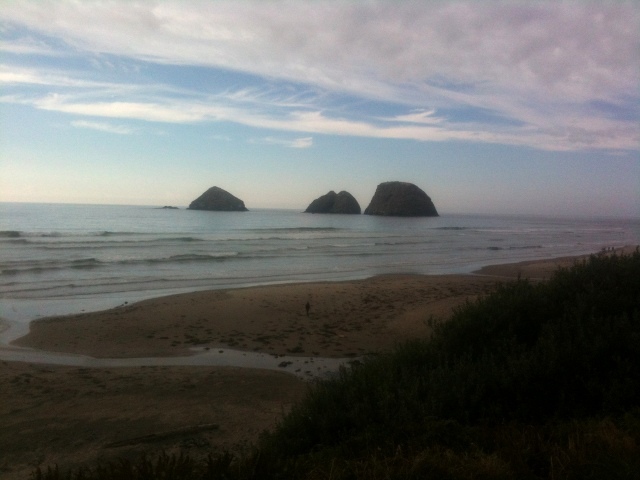 Then a gorgeous ride along the beach and then Netarts Bay and finally to Cape Lookout State Park. 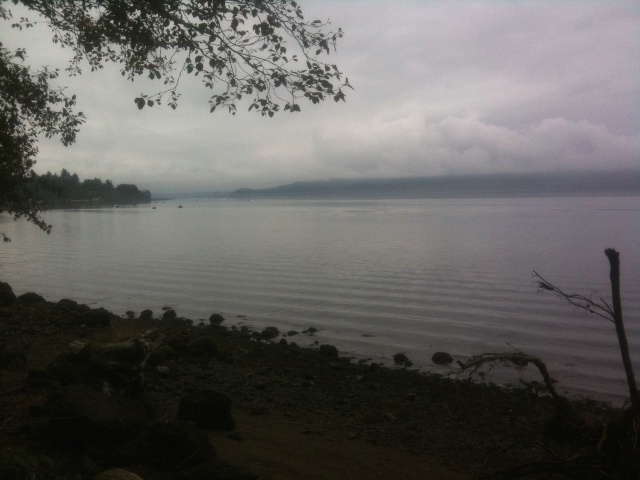 The hiker/biker camp was right near the beach and the sun was now seriously shinning through. Beau, whom I had met two days before already had his camp setup and was on the beach. There were a bunch of other cyclists including Craig from New Mexico and Charley from Portland. According to the ranger this is the most popular cyclist camp spot on the coast. 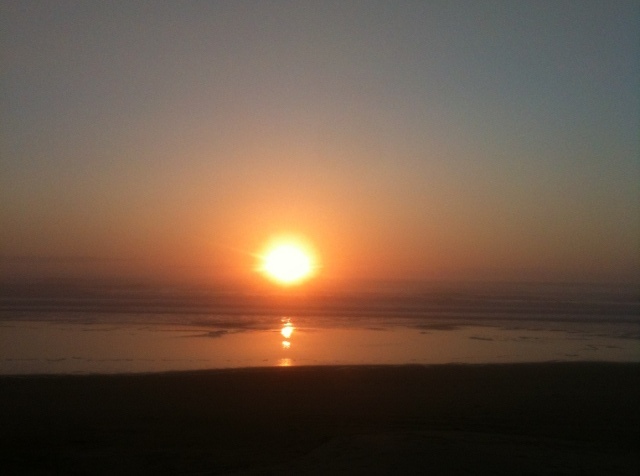 There was a glorious sunset topping an incredable day of riding on the Oregon Coast. 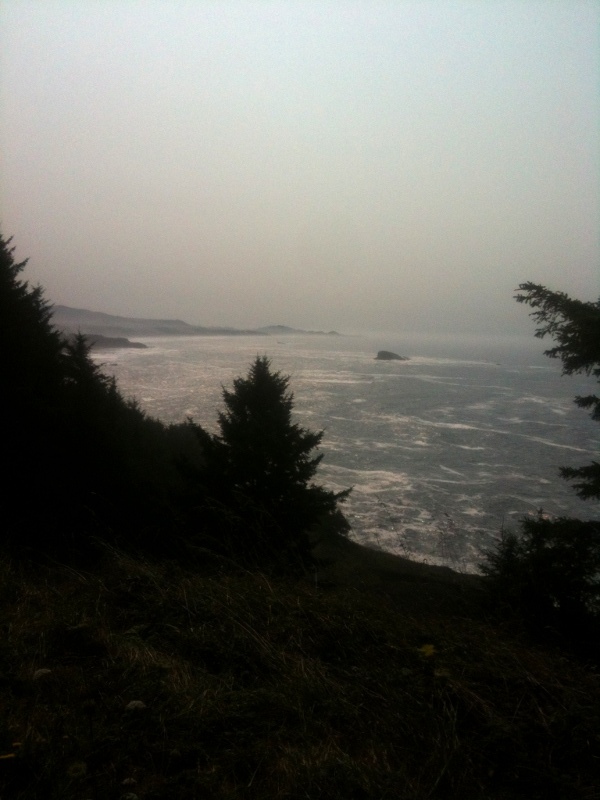 The road wrapped around Tillamook Bay for quite a few miles. A gorgeous susnset at Cape Lookout. Not much riding today which allowed me to relax and spend the moring visiting with Scott and Terri. They've been living there in the woods near the Salmon river since 1980. Probably the most stable people I know. I headed back via North Bank road to Three Rocks Road to 101. On the approach to Lincoln City the nice 4 foot shoulder I had enjoyed on the last few legs of 101 disappeared, which was not pleasant. Soon up ahead I saw a familiar site and caught up with Beau as he stopped to pickup a penny. We chatted a few minutes and I headed on to meet Linda and JJ at Captain Cook motel. 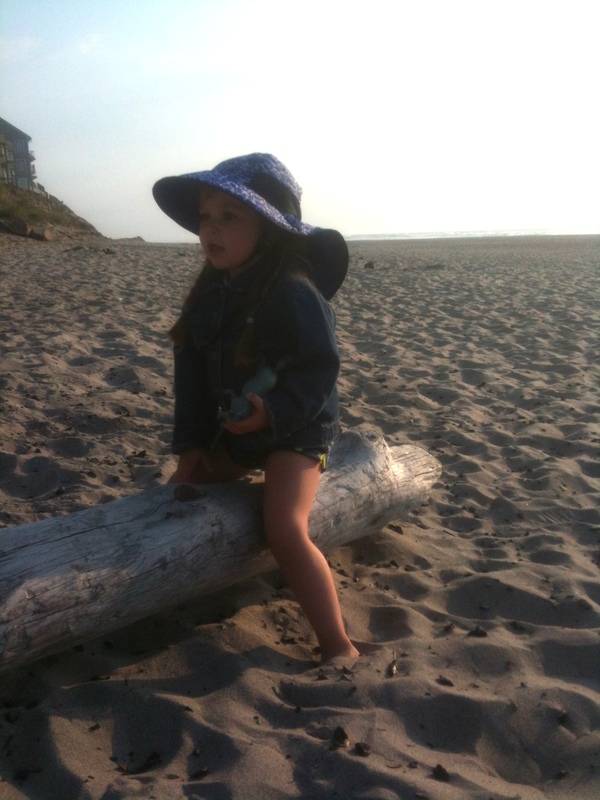 We went to the beach where JJ had a great time, and then went out for dinner. 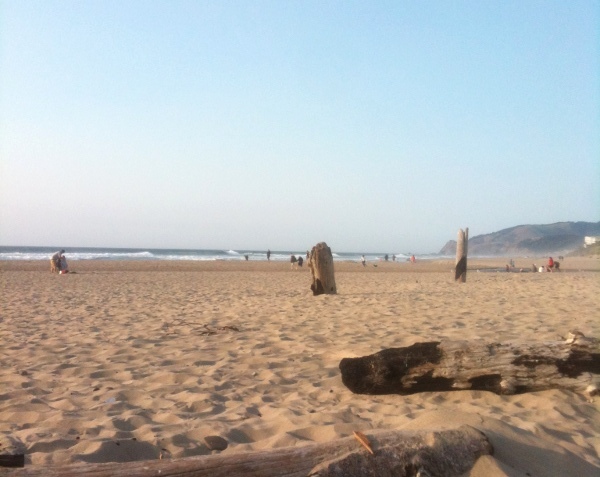 The beach at Lincoln City. Decision day. I could have stayed out a couple more days, but really had no destination. 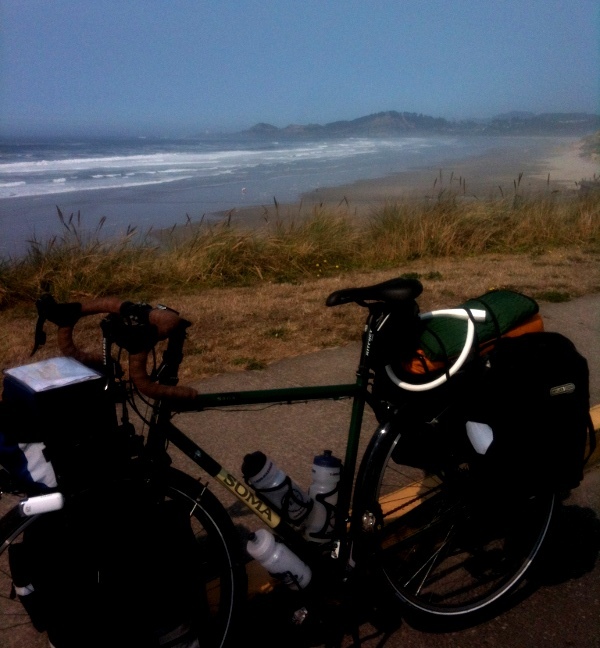 I stopped at the Forest Service office in Waldport to get a map, but then proceeded on to highway 34. Once got out on Alsea highway I could smell the barn and there was nothing stopping me. I was a gorgeous day and there was very little traffic. I stopped the Blackberry campground, but it was far to early to camp. I stopped again at the Salmonberry campground but this is a county park that charges too much for one cyclist. So I kept going. The climb up Alsea mountain was a killer coming so late in the ride. Definitely steeper than anything on the coast. Got home before dark and had a nice long day to show for it. 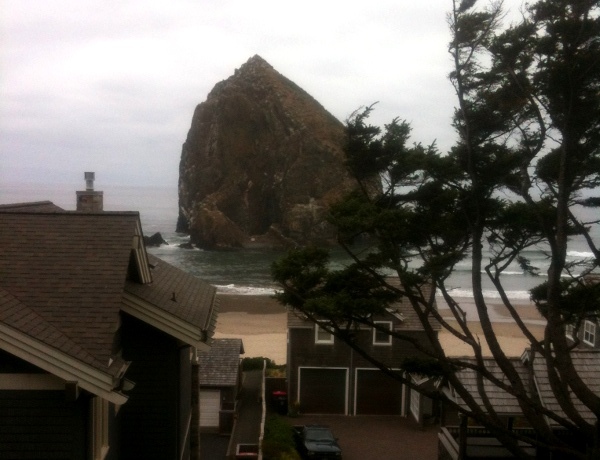 So Stage One of my Coast Tour is complete. Don't know when I'll do the south coast. Probably not next year. Riding the coast is wonderful, but I've spent lots of time on the coast and there are a lot of other places I have never been. So maybe something new next year, and then the south coast. 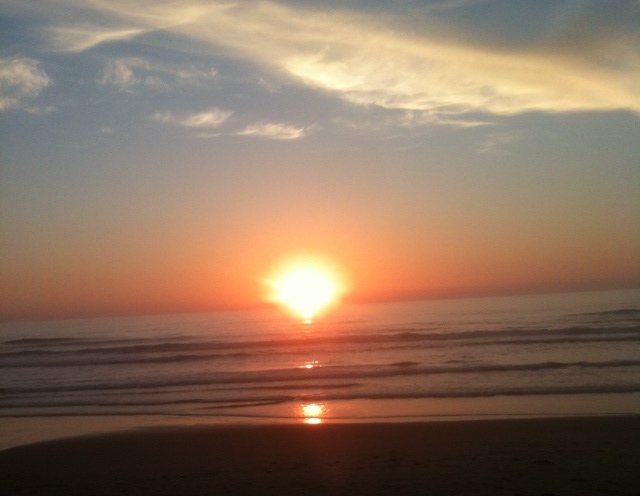 Another great sunset on the Oregon Coast.